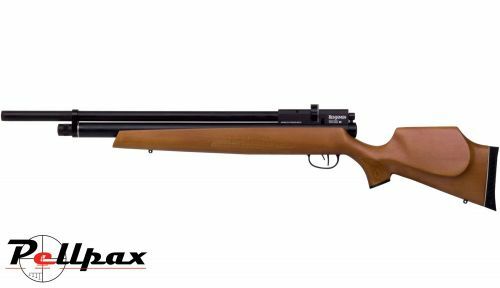 Taking on the European approach to an air rifle, the American made Benjamin Marauder is finished with a deep rich bluing and attractive chequered hardwood stock work as found on the European offerings. When shooting the gun the smooth bolt action system, which is reversible for left-handed shooters, rotates the 10 shot magazine system whilst the two stage adjustable trigger which is located further back towards the grip and allows for an easy pull. This allows you to send the pellet up the internally shrouded and choked barrel making the rifle highly accurate and with only a low thud sound. A deadly combination out in the field. With an adjustable rear stock it allows you to adjust the cheek piece offering superb comfort to the shooter when looking the scope which can be fitted to the 11mm dovetail rail on top of the raised aluminium breech.